Often it has not been a priority to provide rendering that looks the same across different platforms but the more the rendering is based on physically correct principles then visual consistency naturally follows. So instead of fudge factors and magic numbers to make a material look right in a particular scene glTF embraces physically based rendering to help with consistency. For more info on PBR see http://blog.selfshadow.com/publications/s2012-shading-course/burley/s2012_pbs_disney_brdf_notes_v3.pdf and bear in mind that PBR encompasses a range of different techniques and implementation choices rather than just one or two. 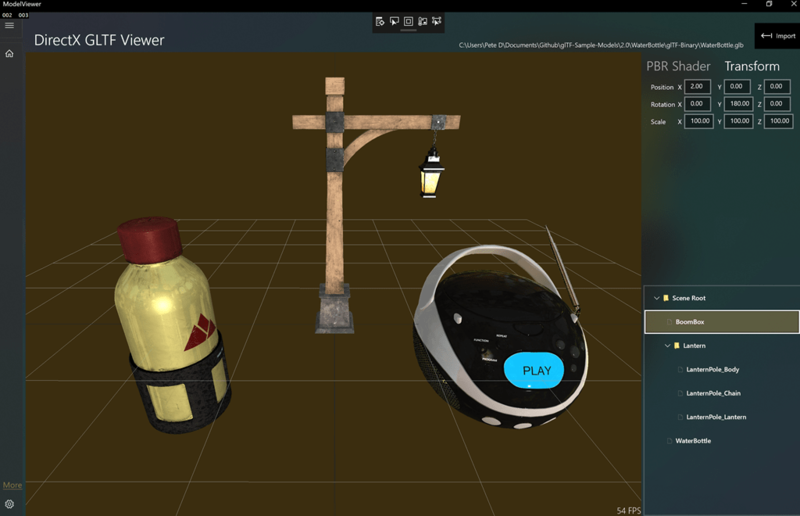 glTF is designed to not require expensive and difficult parsing of the data instead choosing a representation close to how the graphics APIs will require the data. 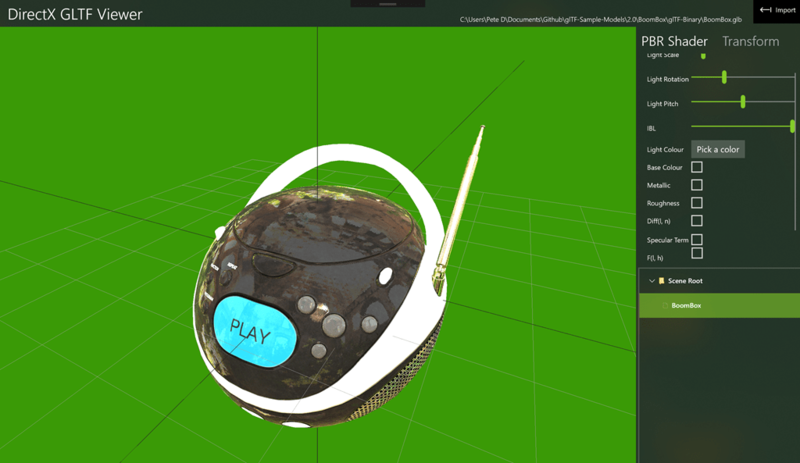 As an example of that consider vertex and index buffers; these exist in glTF as binary data in a file that can be referenced directly as a block of memory and handed off to the GPU using, in DirectX terms by passing the memory to CreateBuffer. 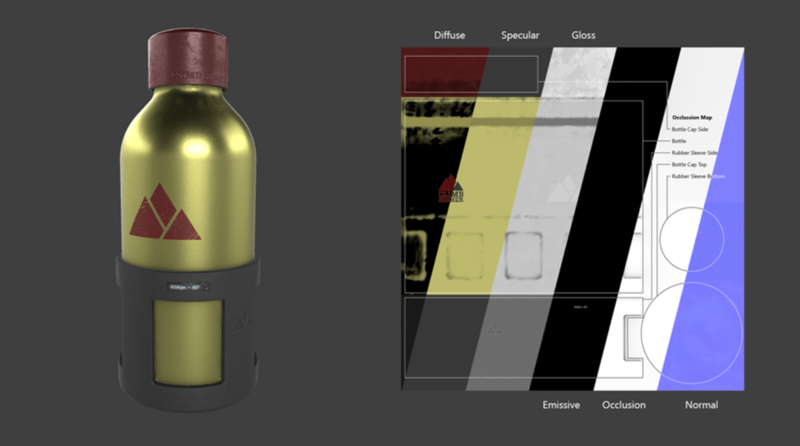 This technique can be used for lighting a model consistently with it’s environment and/or providing realistic reflections. I’m not going to delve into the details of sRGB but here’s some info about how it relates to DirectX https://msdn.microsoft.com/en-us/library/windows/desktop/hh972627(v=vs.85).aspx and for a more general understanding https://en.wikipedia.org/wiki/SRGB. Suffice to say that it is important to understand what colour space you are carrying out pixel shader operations in. Since all of the sample code is here https://github.com/Microsoft/glTF-DXViewer you can check out how the colour space is dealt with both within the shader calculations and when setting up the rendering buffers in DirectX. For the next post we’ll look into the software architecture as even this small sample is quite instructive in how you might arrange the code for a 3D application.